The seller clearly knows what he's got. Update, 6/9/17: Since the original version of this post went up, the car's asking price has doubled—to $1 million. Seriously. We here at The Drive are no stranger to cars on the secondary market asking big money in the name of exclusivity and/or significant historical value. See, for example, this $300,000 BMW M3 CRT, the mint $100,000 Toyota Supra from yesterday, or even that $250,000 Dodge Demon order that was peddled on eBay last week. In the realm of frankly irrational used collector car financial propositions, this latest example might take the cake as the least warranted and defensible non-prank ask for supercar-level money we have ever seen. 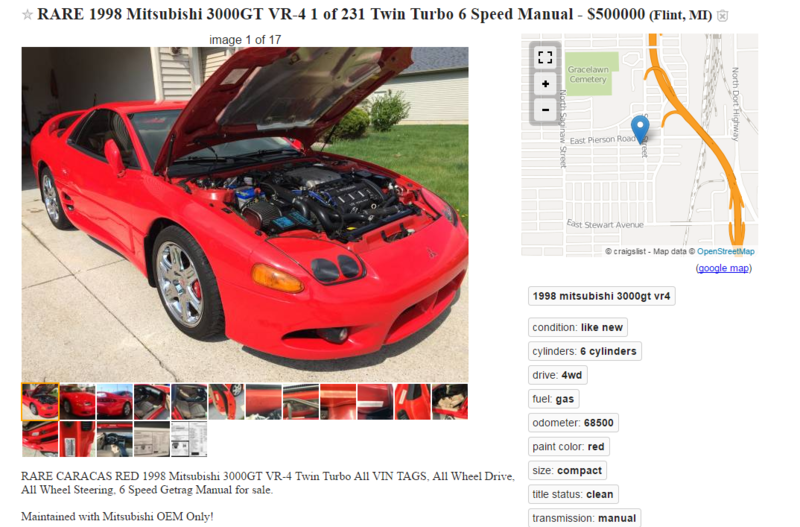 Spotted by Jalopnik on Craigslist is a 1998 Mitsubishi 3000GT VR-4 with an asking price of *drum roll please* $500,000. No, that's not a typo. 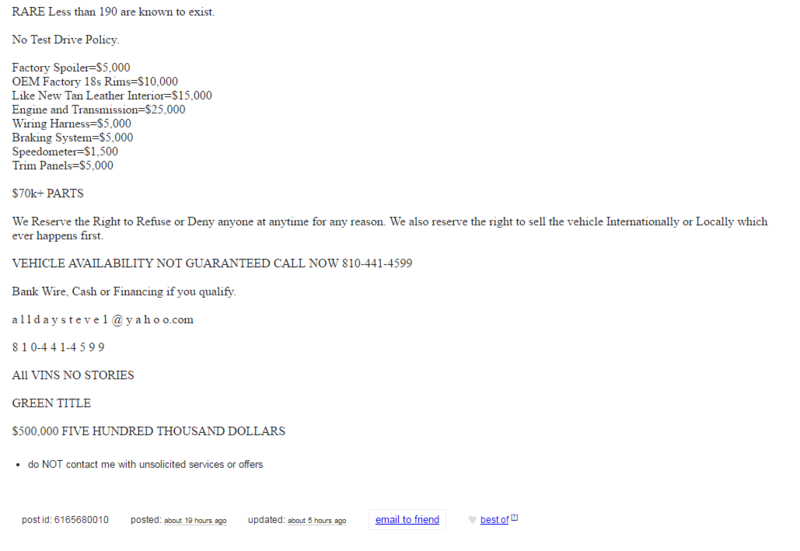 Five hundred thousand dollars. Half of one million dollars. A five with five zeroes behind it... dollars. For your five hundred large, you get a mint condition example of an admittedly pretty rare late 90s Japanese sports car—the best kind of Japanese sports car, many would argue. With 68,500 miles on the clock, this VR-4 features a twin-turbo V-6 that was good for 320 hp when new, a six-speed manual transmission, and all-wheel-drive with all-wheel-steering. Maintained with Mitsubishi OEM Only! Stored inside on battery tender. First owner was an Oracle programmer. Second owner owns a Tech Startup. Only 2 owners of this nearly 20 year old Classic Japan Turbo Legends of the 90s. What, did you think he would just let any old schmuck turn up and take his $500,000 showpiece for a spin? Keep dreaming, pal. To be completely fair, this 3000GT does look extremely clean and well maintained. It would be quite the interesting buy if it were more reasonably less ludicrously priced. $500,000? Hell no. $100,000? Still probably not, sorry. $50,000? Eh, maybe if you're really into fast Mitsubishis, I guess. In the event that the listing gets taken down (as this sort of thing is wont to do once put on blast by the internet), here are some permanent screenshots for... reference purposes. Step one: Admit that you know squat about posting Craigslist ads. Is an A80 Supra with 5,600 miles worth a hundred grand to you? That's almost triple its base MSRP. Your uncle's old ES 300, this ain't.